We invite you to explore India - the Land with infinite beauty ! Whether you soar high into Himalayas or peer under the ruins of the Ancient monuments dotting the landscape of India, you will cherish the experience long after your visit ! This India Travel Guide on Golconda Fort is free from any commercial interest! This site is dedicated to promote India - the vast subcontinent, its glorious past, magnificent landscape and its infinite variety. If you are headed to Hyderabad, do visit Golconda Fort, built on 120 meters high hill. Forts were built by kings to keep the enemies at bay. Golconda Fort is an outstanding example of military architecture, with its impregnable defense mechanism. Golconda was the territory of the Kakatiya Kings. The Fort was originally a mud fortress which was built in the 11th century. The fort was subsequently taken over by the Bahmani Kings. But the structure in its form today, totally made of granite, was built by Qutub Shahi Kings over a span of 62 years. The fort remained the seat of power of the Qutb Shahi dynasty till 16th century. When Mughal Emperor Aurangazeb attacked, the fort remained impenetrable and safeguarded its occupants for nine months. With the help of a traitor, Mughal Emperor Aurangazeb conquered and seized the fort. Soon the fort lost its glory. Nevertheless, visits to the fort continue to impress as it takes you back in time and the grandeur can still be felt and experienced. It is a confluence of Hindu and Muslim architectural styles. The beauty is evident in many of the pavilions, gates, entrances and dome. The most fascinating architectural feature of the fort is the perfect acoustic system, a signaling device incorporated during construction. Even today, a hand clap at a certain point below the dome at the entrance, 'Fateh Darwaza' reverberates clearly at Bala Hissar, the highest point of the fort, almost a kilometer away from the entrance. From here, one gets a great view of the entire fort. The construction enabled the ruler to survey his domain from the terrace seated on a throne carved out of a huge boulder. The indigenous water supply system is another example of architectural splendor. Water wasn't a concern for the occupants even during the months when the army of Emperor Aurangazeb was engaged in fierce war. Hydrological engineering skills have been put to good use as is evident in the way the tanks were filled with water in the palaces and the fountains always in action. A series of Persian wheels carried water from the reservoirs to upper terraces from where the pipes diverted water to baths, cisterns, gardens and kitchens. Fountains weren't decorative pieces but had utilitarian purpose as well. Some remnants of the water supply pipes can still be found. Yet another architectural brilliance is evident in the natural air-conditioning system of the fort. To provide respite from heat during the summer season, the fort has been so designed to let cool breeze reach the interiors of the fort and bring down the heat. There are three aspects in the fort that suggests preventive and precautionary measures that were in place to protect the fort and its occupants from the enemy or invaders. One is the secret underground tunnel which is supposed to lead from the Durbar Hall of the fort to one of the palaces at the foot of the hill. If attacked by the enemy, the tunnels served as escape route for the kings and members of the royal family. The second is the massive gates which are studded with large pointed iron spikes so as to prevent elephants of the enemy from entering the fort through the gates. The third is the outer wall. The fort of Golconda is encircled by a 11-km-long outer wall. This was built in order to fortify the fort. Imagine the Fort bustling with market activities. During the span of 800 years from Kakatiya to Qutub Shahi rulers, the fort-city grew and prospered. 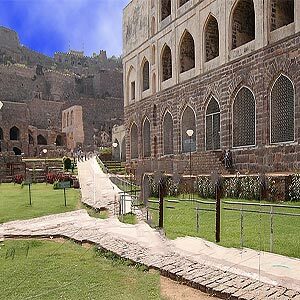 Golconda fort was famous for its diamond trade and the 'Kohinoor' diamond is said to have come from here. The mines of Golconda themselves yielded diamonds though of trifling quantity. The 10km long road from Golconda to outer Hyderabad was a fantastic market selling jewelry, diamonds, pearls and other gems. Mughal kings had a fascination for beautiful gardens. Golconda fort had 33 acres of garden replete with sprawling lawns and playing fountains. What once were well laid gardens today are barren and brown bushes. Though most part of the fort is in ruins, the court hall, queens' palaces, prisons, gardens, office chambers, royal apartments etc are all visible. It is evident that within the fortified walls of the fort residential, military as well as courtly functions took place. Ellamma Devi temple: It is at the top of the fort and a fair is held in every Ashadh month of the year. Mortuary baths: Designed in Persian style, it is a place where ceremonial bathing of the dead body of the royal family was given before burial outside the Banjara Gat. Earthen pipes supplied hot and cold water to the large cisterns. Offices of Hindu officials: The offices of Akanna and Madanna, two important Hindu officials in the Qutab Shahi court are further up. Relics: The large iron weights, half buried in the ground, are curious relics of the past. Step well: Ruins of the Ambar Khana and Bari Baoli (step well) are close to the upper terrace. Traces of the elaborate water supply system that was in use at the time are visible on this path. Ambar Khana: It is the granary of Golconda fort built in 1642. Katora Hauz: Probably the largest mortar tank in the world built in 1560. Old Treasury building: Has now been converted into archaeological museum. Bazaar: Along the same route of the old treasury building is the area where the bazaar used to be. This bazaar was once famous for its diamond cutting and polishing work. Jami Masjid: It is a small mosque built in 1518 AD by Quli Qutub Shah- the founder of the dynasty. It is believed that the founder was murdered here by his son, Jamshed, while praying. Hathion Ka Jhaad: The elephant tree is a massive 700 year old boab tree that was gifted to the Qutub Shahi King by his Abyssinian Guards. Rani Mahal: Zenana Quarters or Rani mahal was about four storied building. Now the ground floor remains. A look at the existing structures reveal that these palaces were built on massive platforms with high ceilings and walls covered with decorative niches, alcoves and cornices, all Persian in design. The exquisitely decorated rooms once sparkled with precious jewels and were surrounded by gardens and fountain. Two separate pavilions: As you walk out of the fort, there are two separate pavilions built on a rocky eminence named Taramathi Gana Mandir and Premathi Nritya Mandir. Two sisters Taramathi and Premamathi resided here and gave dance performances on a circular dais atop a two-storied structure, the Kala Mandir. The king could appreciate the dance from the King's durbar or King's court located on top of the fort. Ramdoss BandiKana: The great poet Ramdoss was imprisoned here. He was an official who incurred royal displeasure. While in prison, he made idols of his favorite God Rama and Rama's consort Sita and brother Lakshmana which can still be seen here. A small hole through which food was served to the imprisoned Ramdoss is still visible. Visitors are allowed to enter the fort from 7:00 am and after the sound and light show the fort is closed at 8 pm (daily). On Monday the fort is closed and visitors are not allowed. The temperature in Hyderabad remains moderate in summers and winter. One can visit the city through out the year, but the best time to visit Golconda Fort is between September and March. From Hyderaba, Golconda fort is about 11 kms away. Apart from buses, auto rickshaws and taxis are available. The best way to wrap a visit to Golconda fort is to watch the sound and light show which depicts the glorious past of this grand fortress. This audio - visual extravaganza is presented in English, Hindi and Telugu. The show begins at 6.00 or 7.00 pm; the duration of the show is nearly an hour. Presentation in English is only on Wednesday and Sunday.